Standard registered users on DASH have a pile of things under their tree, but there’s even more stuff in the stocking when you upgrade your membership. 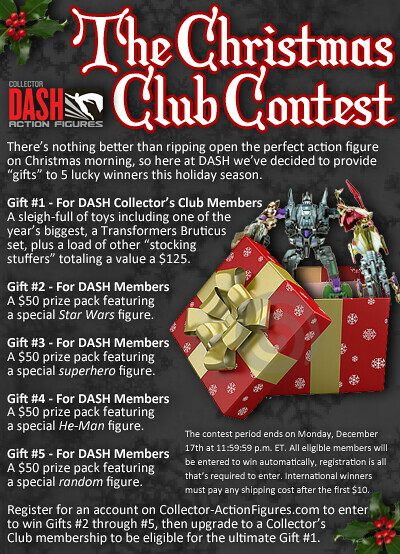 Not only do you get access to the world’s best action figure values, detailed collection reports, and full use of a great mobile app for collectors, you’re also part of a select group eligible to receive the ultimate gift in our Christmas Club Contest. If you thought that was all our contests currently running, you must be lacking some holiday spirit. We’re adding new contests every week, and the only way to see them all is to Like DASH on Facebook. We hope you have a great holiday season, find a toy or two under your tree, and make the most of your collection with DASH.